The cash was handed over, the log book entry filed and the great big jangling keyring with 8 keys changed hands. I’d totally forgotten how old cars have keys for doors, ignition, petrol cap etc all seperate let alone all the additional ones that come with a campervan. The drive home was nowehere near as scary as I’d feared. Once I had actually got her started and staying ticking over (manual choke, a blast from the past!) and wrestled with listening to revs and deciding which of the not gears but letters on the not-a-gear-stick made the most appropriate noise all was well. It felt good to be high up and I don’t think the length or breadth is much more than my people carrier actually. Sitting on our drive looking pretty 🙂 She just about fits. Here’s D and S in their bunk. 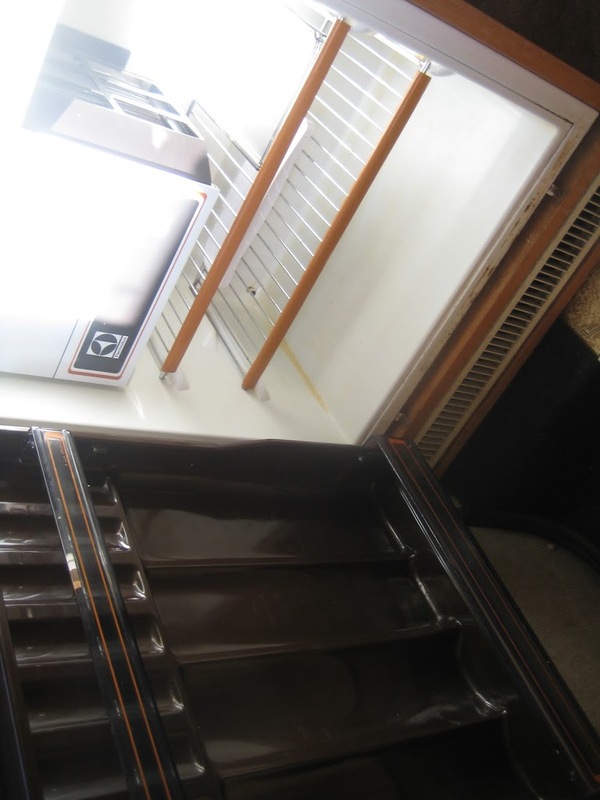 The seller had already put a sleeping bag each up there for them. They will have pillows and other bedding from home to keep them snug and warm. The bunk has a pair of curtains that slide across to keep it seperate, a light, tiny slit windows at each side and a wind up and down skylight (D tells me he intends opening it in warm weather so he can sleep gazing at stars) and a cubby hole each for keeping stuff in. The cubby hole has a light. They easily both fit there and have already decided who is sleeping which side. There is plenty of space for them to keep most of the few toys etc they will be taking with them for the year. During the day and when travelling our bedding will also live up there along with the ladder they use to clamber up. 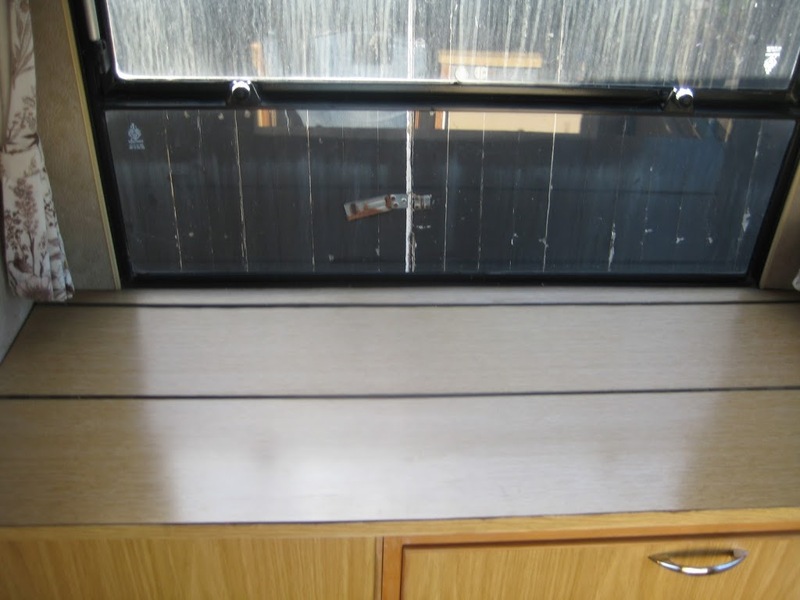 This is the view from the bunk, on the left is the sofa / bed / table and on the right is worktop over storage, heater and fridge. 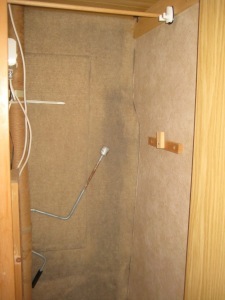 There are storage cupboards along both sides. 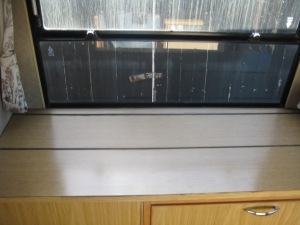 At the back of the van is the kitchen area, a bathroom and that all important rear windscreen. 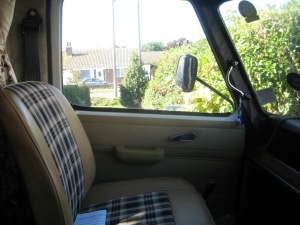 The view of the cab from inside the van. 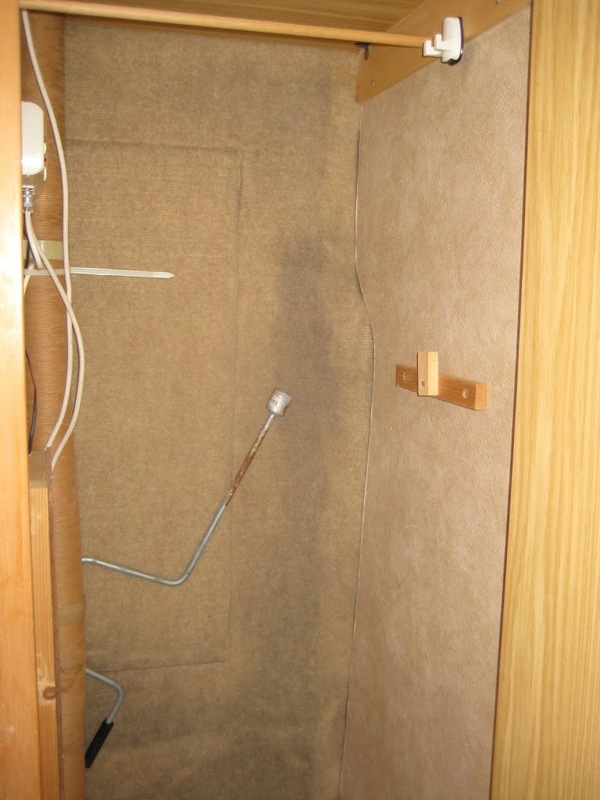 Here’s our wardobe complete with hanging space. The cable belongs to the aerial and the random tool is some sort of jack. 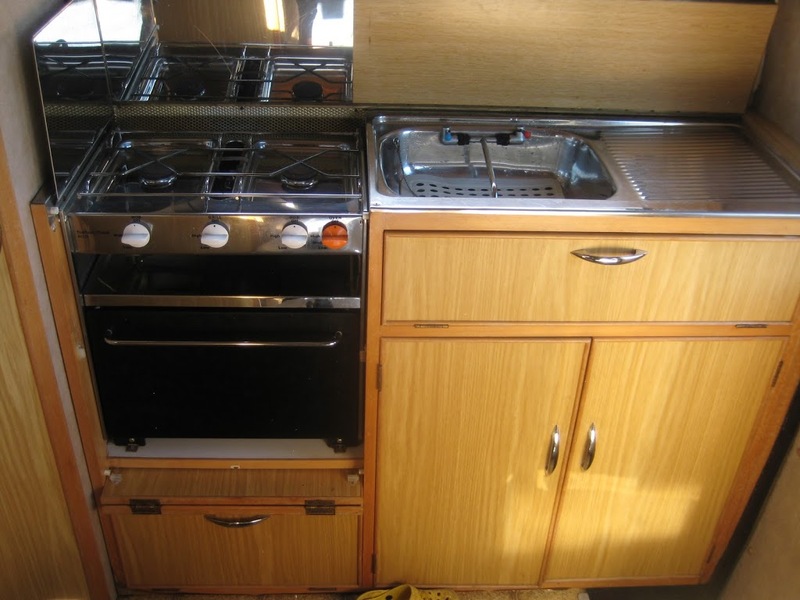 The worktop along the right of the van – the sellers included a toaster, kettle and mini TV in the van. The van has a secondary battery which runs all the appliances when hook up is not available. You can also switch over to use the vehicle battery when the engine is running. 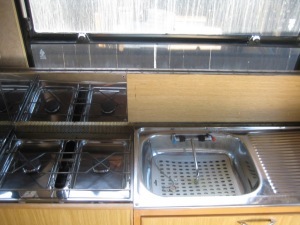 The fire and hot water and oven are all gas fired with two bottles kept in a special exterior recess. The fridge is super clever and can be run on gas, battery or mains hook up. We have ordered a hook up converter to fit to the end of the hook up lead so we can run everything off mains at home on the drive and at hosts with outside electric supply. I can’t get this picture to rotate but you get the idea. It has 2 shelves, a tiny ice box for frozen bits and plenty of storage in the door. Here’s the fire. It really chucks out the heat (and I suspect eats gas!) so should keep us toasty when it’s cold outside. It might also be handy for those ‘everything we own is wet’ moments. The ‘hub’ of the van. It’s a table and chairs, it can be a four legged table moved out to make room for all four of us to sit around, it will be a sofa for relaxing on, seats for the kids while we’re driving and also folds down to make the double bed where A and I will sleep. Truly multi-functional. I may have to change my mind about tables ;). 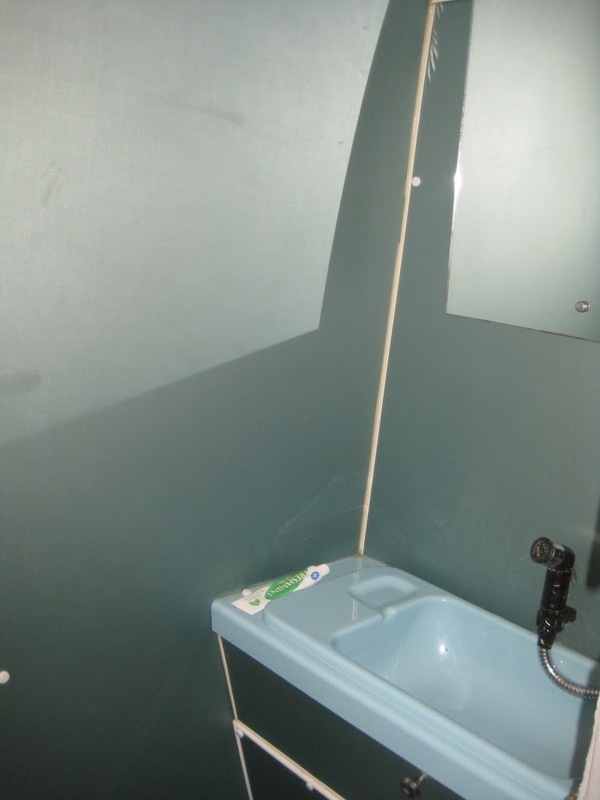 The bathroom – as a friend pointed out this is not a complete room photo – this just shows a corner of the mirror (which has a light above) and the sink. Also there is a shower head on a hose and a portapotty chemical loo. The whole floor of the room is a shower tray and a shower curtain pulls around. The shower heater is the only non-functioning part of the van currently. We are planning on getting it fixed or replaced as whilst I don’t think we’ll use it often it will be useful to have when needed. This is our very clever kitchen area. When all the surfaces are down it is a worktop. 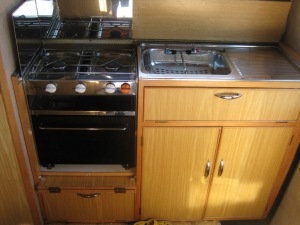 Fold back the cupboard which slots into a recess underneath and you expose the oven and grill too. Under the sink is a cupboard complete with cutlery tray and a double cupboard for more storage. I emailed a friend this week to tell her about our plans. We met her when she used to look after D and S a couple of days a week when they were tiny and I was out at work. I wasn’t sure what her reaction would be to the news really but it was positive, supportive and 100% unsurprised. Most people we have told have taken the news in their stride with several describing it is ‘inevitable’, knowing us as well as they do. I spent some time at a childrens’ birthday party held in a soft play centre yesterday, with a group of other Home Educating friends and one of them was saying how in her Home Ed circle of friends she feels very conventional and normal, it’s only when she steps outside of that group and into other circles that she realises how very different her life is to most other peoples! I feel a bit the same, I forget that many of our family’s life choices totally buck the trend or the norm and it’s only when I look back along the path we’ve trodden that I realise how each slightly off the wall decision has taken us further along the path of non conformity and doing things our own way. I intend posting about Home Education properly and just how I envisage it working while we’re off for our year but the main purpose of this post was to talk about some of the books I have read in the last few years that have guided me towards what now seems to have been a rather inevitable decision to head off on our adventure. My favourite way of finding out about something is always to talk about it. I love talking, I love finding out about people, asking nosey questions and understanding what makes people tick. I think learning something from someone who knows about it is the very best way to gain a new skill. But it’s not always feasible and the next best way in my opinion is to read about it. Blogs, books, magazines, however you like but a well written piece is as close to sitting listening to someone as you can get without them being in the room. Several of the books I have read over recent years have set us on the road to our adventure next year, I can’t say they are on my bookshelf as I have borrowed them from the library (cheaper and more eco-friendly) but however you read your books I’d recommend these ones as worth looking at. is a great book. Follow Kath on her drunken self inflicted challenge of living on just 100pence a day for a whole year. Kath meets all her basic needs and more at bargain prices and shows just how little money we *really* need. The Strawbridge family may already be familiar to you from the TV show of the same name as the book – also worth watching. There is a website and forum for even more ‘Not easy being green’ goodness if you are so inclined and inspired. Scenes from a smallholiding (and indeed the followup book) were one of my very early reads when thinking about a change of lifestyle. Chas and his family including in-laws set off to live on a smallholding and this collection of articles, essays and autobigraphical accounts of the various challenges, victories and steep learning curves gave me ideas and inspiration aswell as a real insight into what it might be like living that lifestyle. is easily one of the most thought -provoking books I’ve read and one I have recommended to various people. The story of how a NY self-confessed ‘eco-worrier’ had a go at a zero impact lifestyle going from takeaways infront of the TV and regular air travel to a cycling, off-grid, no packaging, no waste comparison and all of the challenges along the way. I confess to not having quite finished reading this myself yet, I am about halfway in but already know it is another book that stays with you after you have finished it. Powerful lessons to be learnt alongside Fred as he travels to find out where the gold in his wedding ring was mined, just what ‘fair trade’ means on his coffee packet from the growers themselves, questions whether buying local is actually any better when those local strawberries have been picked by poorly paid foreigners living in crappy conditions and educates us about bananas into the bargain! We are all huge fans of Hugh Fearnley-Whittingstall and watching the River Cottage series of shows and using the accompanying cook books has been a real inspiration to us and certainly set us well along the path to growing our own veg, rearing our own animals and generally becoming more aware of where our food comes from and striving towards producing as much of our own as possible. It’s hard to choose a favourite River Cottage book to link to but I have gone with the Family Cookbook as D, S and I have spent some time recently working through it step by step. We’ve baked our own bread, created our own sourdough starter, made all sorts of flour and dairy products, gone to work on eggs and much more. Forget Delia, for me this is the ultimate bible of food and guidebook to your kitchen. Another of our heroes is Ray Mears. We love his tv shows and have borrowed them many times from the library, particularly watching the dvd extras over and over again trying to learn how to make nettle cordage, whittle useful things and chop wood, sharpen knives and learn other survival skills. Again, tough to pick an item to link to really but this book is on my very short list of books I intend actually bringing along on adventure with us. This is on my wishlist rather than recommended. We are on a very strict budget next year on our adventure and hoping to spend very little on food. In theory WOOFing means in exchange for working you get food from hosts but we are hoping to supplement that with some wild food gathering. A is keen to do some rabbit trapping, pigeon shooting and fishing and learning about what else is out there for the taking would be a great skill to master, particularly in hungry times :). This little gem is among the Collins pocket sized books we already own and will definitely be coming with us. I’m sure I’ll be back with more in the coming weeks but this is a good start. 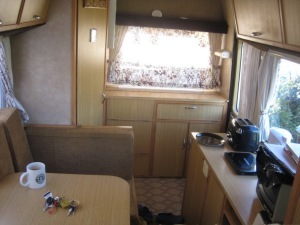 Am very excited and all fidgety on my sofa about bringing the campervan home tomorrow. I will have plenty more pictures to share once she is safely on our driveway but I do have a sneak peek of her for you. This is actually a picture of a picture. The van has something of a back story, which is charming, I love the fact it isn’t just some random old van. She will be 30 next year, I think taking her round the UK will be a fabulous way of celebrating that milestone birthday with her :). The people we are buying her from have had her for a year and I *think* (will find out when I see the log book) that there have not been many more owners previously but this picture is taken on the driveway of the owners before them who christened her Willow. Because in order to have her and keep her on their driveway they had to have a willow tree cut down so she would fit. This comes only a week after we went on holiday to our favourite campsite and due to them having staff there called ‘Hazel’ and ‘Ash’ we’d had a converation about trees that could be names. I’ve never actually named a vehicle before (if you don’t count my current people carrier being known by D&S as ‘The Nicmobile’) but this feels quite fitting. Willow also comes with a very cool registration number which a friend very quickly decided stands for ‘Our Camper Home 2 Wander’ which I love. So tomorrow after work I’ll be bringing her home. I have to confess to being quite daunted at the prospect of driving such a big, heavy vehicle. 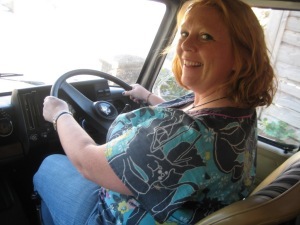 The van is automatic and with the exception of a couple of hire cars over the years I have only really drive manual and it is wider and longer than anything I have ever driven before. However I learnt to drive in a tiny Peugeot 305 and my first car was a mini, I now drive a seven seater VW Sharan so I’m guessing it won’t be too much of a scale upwards. I have driven more than my share of bangers over the years including cars older than me so I am confident I can ‘be the adult’ in our relationship ;). Plus I always did hanker after being like Long Distance Clara of Pigeon Street and I reckon this is about the closest I’ll ever get. Wind me down that window, stick my elbow out and get me a cap to wear, lock up those Yorkie bars, I’m about to get truckin’. We got the van, now where we gonna park it? Not during the next few months before we go, I have my fingers firmly crossed that it will fit on our drive tomorrow evening when I bring it home. I mean where are we going to park it during the year’s adventure. Having broken our route down into four zones with rough timescales – Zone one, Southwest (Dorset, Devon, Cornwall) March, April, May, Zone two, North Wales, June, July, August, Zone Three, Scotland, September, October, November, a break in December as we hope to have a week with friends and some time over Christmas back home with family before finishing off in Zone four – the Southeast and East Anglia, January and February. We started by going through all our hosts again in Zone One. Our initial selection of hosts to get down the list of 107 was done by simply reading them out and voting yes or no between the four of us. We now went through them looking for diversity in types of host and what they do on their land so we would get a good mix, checking they take WOOFers in March, April and May and looking at their website if they have one. Several of them do actually, intentional communities who recruit new members, businesses selling their produce, sustainable living types who run courses on site, smallholders who have camping or holiday home businesses running alongside. We drew up a shortlist of our favourite 15 and emailed them all. We had a brief biography of each of us and us as a family, along with what we are doing next year and why. I then tailored the email personally for each potential host explaining why we had chosen them. We are N, A, D and S. We are hoping to spend a year from March 2010 travelling around the UK WWOOFing. 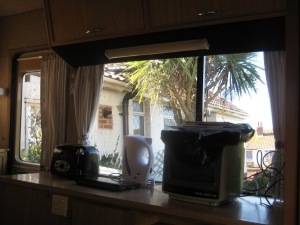 We have been hankering after a more self sufficient, greener, simpler lifestyle for several years and have been moving towards it in small ways in our home on the south coast of England. We have an allotment and grow food in our garden at home. We keep chickens, bantams, ducks and quails, most of which we have hatched in an incubator or bred from our own livestock. Our eventual goal is to become self sufficient and have as small an environmental impact as possible. We want to learn all we can about all the aspects of this lifestyle while getting a realistic idea of what it all entails. We are hardworking, fast learning, friendly and cheerful. Our children are well behaved, responsible and keen to learn alongside us. A currently works in retail support and merchandising of bedding plants. He has previously worked in all sorts of careers including Retail Management, game keeping, managing an indoor rollercoaster and a spot of TV presenting. A wants to leave the 9-5 behind, learn about rearing animals and butchery, spend more time with his family and live a simpler life. N has also worked in a wide variety of jobs from Retail Management, Recruitment and Marketing but currently works part time at the local library whilst being at home with D and S. N had done some volunteer shepherding, overseen the hatching of over 100 birds, loves baking, preserving and is learning about wine and beermaking in an experimental fashion! N wants to learn more about beekeeping, dairy farming (including milking a cow, making cheese etc. ), lambing, calving and growing fruit and vegetables. N can crochet, knit and sew a bit, has done some basket weaving, rag rug making and interested in natural crafts. N is a qualified Waste Prevention Advisor volunteer with the local council which involved a course learning about composting, real nappies, waste collection and processing, recycling and landfill and other green issues. N loves the idea of off-grid living and would love to learn more about sustainable, renewable and alternative energy and building. D is ten and loves bushcraft, survival and being outside. He’d love to learn to drive a tractor and understand how it works. D loves animals, particularly sheep. His other passions are film making, drawing and storytelling. S is nearly eight and loves animals. She has hatched and raised ducklings this year and is interested in breeding, rearing and keeping animals. Both D and S enjoy baking, breadmaking, growing fruit and vegetables and learning about where our food comes from. They are interested in nature and wildlife, the world around them and how everything works. D and S have always been Home Educated. We’d love to come and meet you and work with you and look forward to hearing from you. We got a very diverse cluster of replies including some yes, no and possibles. I quickly realised that 15 potential hosts would not be enough to fill 12 weeks so emailed the other 15 on the short list too. Replies are still trickling in, some have been direct ‘yes, you sound great, I’ve written you in the diary’ responses, similarly we have had some ‘no, we don’t have room for four people / the farm is too dangerous for children / we are already booked up with WOOFers for those dates / we’re no longer accepting volunteers’ along with a few more complicated replies, some of which are hopefully not insurmountable. We have had several who have had more questions for us and plenty who have said yes in theory but want us to contact them nearer the time to firm up dates. I need to redraft the email! Lots of the replies said that we sounded like we could teach the hosts more than they could teach us. I had tried to strike a balance of coming across as useful and interested but fear I may have overstated us to sound like a band of travelling experts, which is not only not the case but may come across as either boastful or intimidating. I need to scale it down a little I think. I need to make our circumstances clearer. 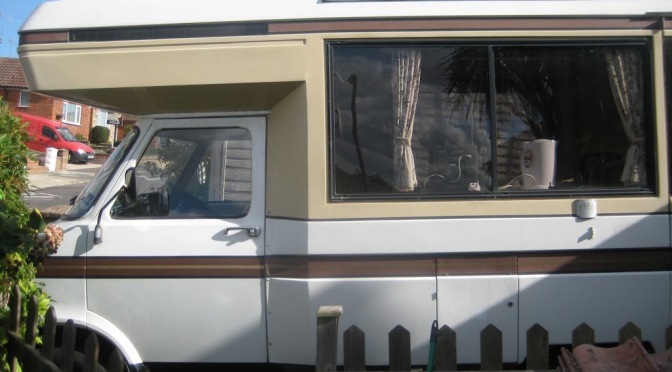 I have mentioned the campervan but not been specific about us being happy to live in it if hosts cannot actually accomodate us. Ideally we will be able to have access to a bath / shower, eat at least one meal a day with hosts and fingers crossed make use of things like washing machines, but we are up for living in our van and indeed camping in a tent during the warmer months. I think I need to be slightly more speculative in our initial email. Mentioning the rough time we will be in the area and asking for a theoretical yes or no is probably sufficient initially with a follow up contact nearer the time to confirm things. It has been really tempting to want to have the entire year planned with everything totally sewn up. I’m quickly realising this is neither feasible or practical or indeed particularly desireable. I think a big part of the nature of next year will be learning to go with the flow and see where life takes us. We do however have five weeks worth of WWOOFing hosts fully secured with dates, a further 4 weeks or so ready to confirm a date next year and a few more we are still conversing with to set dates. I’m planning to redraft the email and start looking at our Zone two shortlist again, looking at the hosts websites if they have one and getting in contact with a less CV-esque intro email, being clearer about the campervan and giving a rough idea of the dates we’ll be in their area and asking if we sound suitable WOOFers to get back in touch nearer the time. July – tell family and friends about the idea – get their feedback, revel slightly in new novelty status of ‘nutters we know’, take on board all of their concerns, questions, ideas and suggestions (except ones like ‘stop being so bloody stupid,of course you can’t go off for a year doing a mad thing like that!’ which we just ignored). Join WWOOF and start looking at potential hosts, reading out all of the ones who accept children and drawing up a short list of ones to contact. 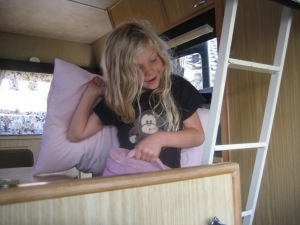 August – Start Operation Crap Clear and being building up Campervan Fund. Plot hosts from shortlist onto a map and work out a provisional route for the year. September – continue Operation Crap Clear, begin contacting first round of hosts in Zone one and start booking WWOOFing matches for March, April and May. Give notice on allotment. October –begin contacting Zone two hosts for theoretical bookings in June, July and August with dates to be firmed up nearer the time. Further Crap Clearing including getting rid of summer clothes now the season has changed. Begin finding homes for chickens and ducks. Look into notice periods for sky tv, BT phoneline, broadband supplier, mobile phone contracts etc. November get my car MOT’d (it’s due in December but you can get 13 month tickets). 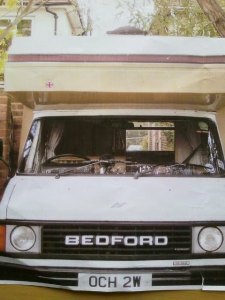 Try to sell car and buy campervan with raised funds, saved money from frugal lifestyle over last few months. Finish Operation Crap clear so house is empty save for essentials. December Get used to life without car, finish all kids ‘afterschool’ activities, decorate house and get rental agents in to view it, choose one or more and let them start marketing house for rent. January give notice at work, contact hosts to firm up bookings for Zone one, contact Zone three hosts for theoretical booking of dates, rehome animals, secure tenant for house. Give notice to all monthly paying things which won’t continue while we’re away. Do final CrapClear so all remaining is being stored or coming with us. Organise insurances for house and campervan. 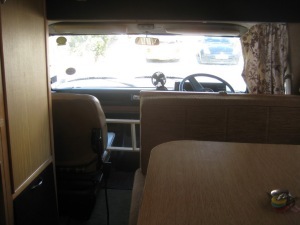 February MOT campervan, box up things for storage and move to parents house, host goodbye party, leave jobs, pack up van, wave goodbye to house and head off for year of adventure and enlightenment on March 1st! We decided to research some campervans to get our heads round how much space is inside one, what it might feel like to be in the driving seat of one, what sort of designs are around and what our favoured make and model might be. We were anticipating a budget of between £2000 and £3500 with £1000 coming from the sale of my car, £1000 coming from money we’d saved, £500 from things we’d sold and a possible loan from my Dad which I’d not asked him about yet to top up if needed. We’ve been looking on ebay and other internet sites and this seemed a realisic budget for something suitable although we had reservations about buying off ebay unless we were close enough to go and view it first. So we headed over to a localish caravan and campervan dealer to look at the 50 or so vans on his forecourt. They ranged in price from £80,000 down to £8000 and from gorgeous luxury to one I wouldn’t have wanted to be drive somewhere in let alone put my head down and sleep in. We concluded that we wanted as compact as possible design-wise, with an over-the-cab bed for the kids, a toilet is a necessity and a rear windscreen with a rear view mirror would make a far less scary driving prospect for me. A friend had pointed out a couple of vans for sale in the local free ad paper the day before but as we only had the first £750 in the fund (from savings and carboot sales and ebay) we were not at all ready to be looking. On the way home from looking at the dealer though we decided on the spur of the moment to ring one of the free ad sellers. 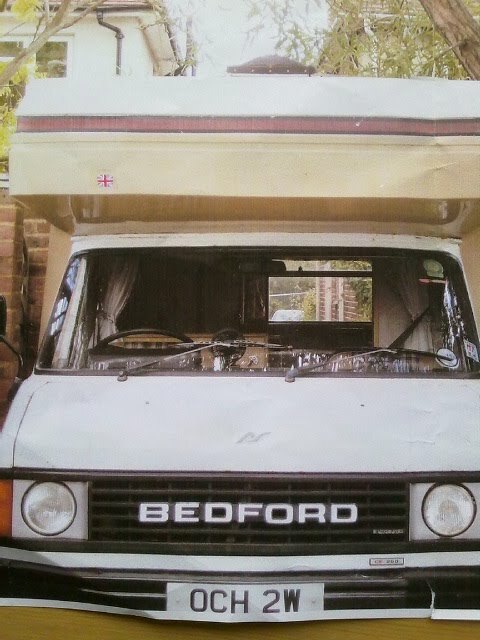 The ad was a bit rubbish, there was a typo in the model (Bedford cf instead of Bedford CS) and it didn’t say what berth the van was. I rang to check and was told it was four berth so arranged to go round and look at it the following day in a ruse to get the address and go and sneakily check it out. 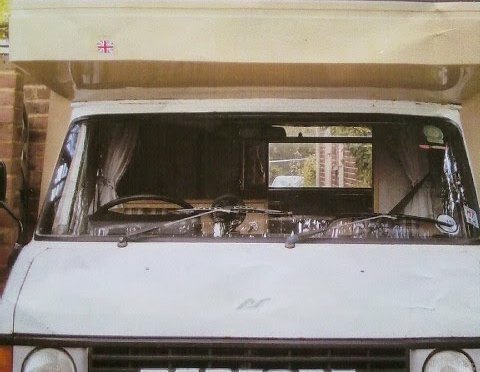 To be honest we just wanted to see what a van within our budget (advertised for £2500) looked like having been quite horrified at the vans for £8000 on the dealers forecourt which had damp, scruffy, smelly interiors with stained carpet, skanky curtains and the odour of cigarette smoke and wet dog. We were both dealing with slightly sinking hearts at the realisation it might all be not quite as feasible as we’d hoped. The seller lives not far from us and on first glance the van looked great, so much so that we rang on the doorbell and introduced ourselves, blowing our cover of sneaking round for a peek and had a look inside. 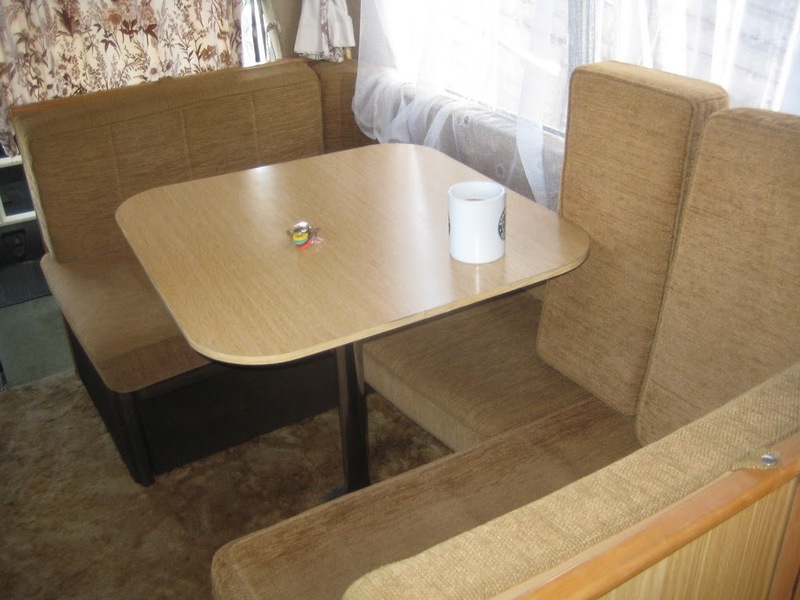 The sellers were lovely, an older couple who have traded up to a caravan having had the camper for a year and taken their grandchildren off on holiday in it. The woman showed D and S round, letting them climb the ladder to the bunk that would be their bed and encouraging them to open all the cupboards and look at everything while A and I looked round the exterior and had a sit in the cab. We promised to ring with a decision one way or the other the following day and then came home to agonise. 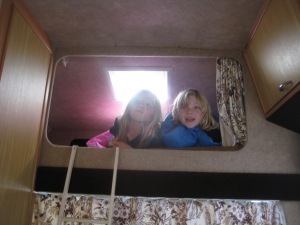 On the plus side we had fallen for the van, the kids loved it, it ticked every single one of the boxes we’d drawn up earlier that day about design, was clean and tidy inside and out and a five minute drive from home. On the downside we had less than a third of the money and it was not scheduled for another three months! Come payday on Friday we’d have the rest of the money to make up to £1000 so I talked to my parents about subbing us another £1000 until I sold my car and planned to make an offer of £2000 for the van. My parents came over with me for a second look, the sellers accepted £2000 and I paid them a deposit and arranged to go and drive the van away on Friday. So, we’re well ahead of schedule on getting the van, we’re well under budget on buying the van and one of the biggest steps along the way, getting the transport and home for the year is already sorted. Travelling round the country with everything we need for a year was always going to take more than a snail’s shell for the four of us. We have long hankered after a campervan anyway and this is the perfect reason to trade in my rather tatty Sharan people carrier for one. It will enable us to sleep in our own van, take some time out from our hosts if needed, be able to cook/ wash / sleep / use the loo etc in our own space and have plenty of room for all the ‘essentials’ we’ll be bringing with us. It will also mean we can take time out on campsites along the way, stay with friends without imposing too much and if all else fails simply pull over and make a cup of tea. My car has been a true and faithful friend for nearly 9 years, and has shephered me and the two children around along with many friends thanks to it’s seven seats. 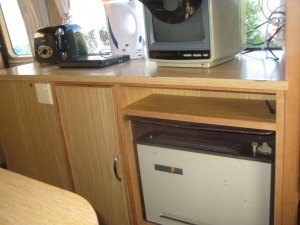 It still gets through it’s MOT each year and despite looking rather shabby inside and out (white is never a great colour for the outside, and pale grey is even worse for the interior when it is a mobile Home Education Unit! The car is due an MOT in December so it is my plan to put it through a month early in November with fingers firmly crossed that it passes or at least doesn’t need much work to do so. 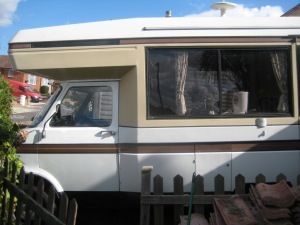 At that point it will have a year’s MOT and six months tax and hopefully be a viable buy for someone else and give us a big cash boost to the campervan fund. The fund is currently made up of Operation Crap Clear funds from ebay and car boot sales. We have also been living fairly frugally and intend to carry on doing so saving a couple of hundred pounds a month. 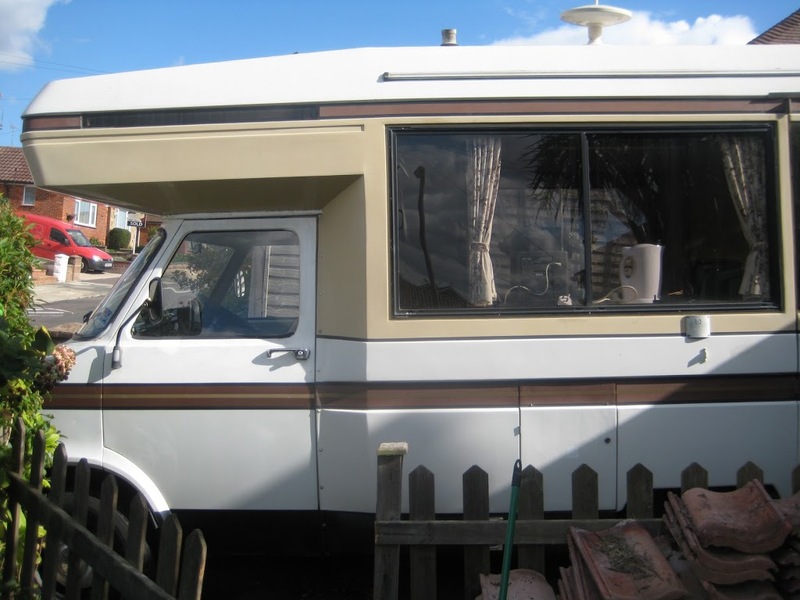 Whatever we have raised from selling stuff, selling the car and saving money will be our campervan fund come November /December.